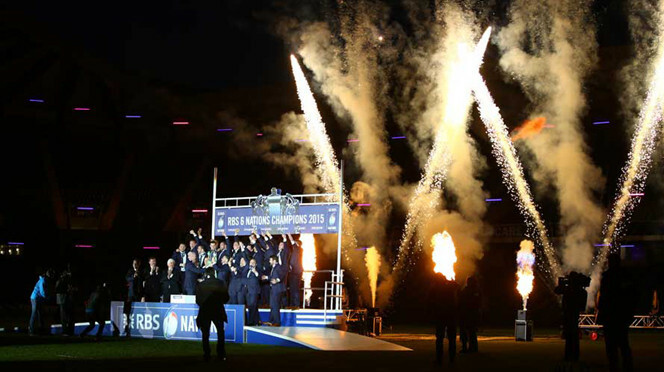 Champions Ireland retained their Six Nations title on points difference after an extraordinary final day. The last round of games concluded with England falling agonisingly short of the 26-point winning margin they needed as they beat France 55-35 in an epic. The day had started with Wales annihilating Italy 61-20 in Rome. Ireland needed a huge win and their 40-10 demolition of Scotland was enough to both pass Wales and set a target just beyond England. With three teams on three wins apiece going into the final round of games the stage was set, and what followed was one of the most incredible days in the tournament since it was first played in 1883, with 221 points scored in the three matches. England started Saturday as leaders – just – from Ireland on points difference with Wales some way further back, and they would play in reverse order to decide who would become champions. In the opener, Wales only led Italy by a point at half-time in Rome but cut loose in the second half, with George North’s hat-trick ensuring Ireland needed to beat Scotland by 21 points to take the lead on points difference. The champions duly hammered Scotland by 30 points in Edinburgh, meaning Wales were out of contention and that England needed to beat France by 26 points to take the title. In a see-saw encounter at Twickenham, England pulled steadily clear but never managed to get into a lead that would have denied Ireland the title. However, Jack Nowell’s try with five minutes remaining put them 20 points ahead and meant a converted try would have given them the Championship. They spent the closing moments hammering away at the French line in search of the winning points, and came within a foot of scoring, but in their desperation they infringed and the final whistle meant that although they had won handsomely, it was Ireland who are 2015 Six Nations champions. Ireland were knocked out of the World Cup by Pakistan, who qualified for the quarter-finals with a seven-wicket win. Set 238 to win, Pakistan reached their target with 23 balls to spare thanks to Sarfraz Ahmed’s unbeaten 101 in Adelaide. Ireland captain William Porterfield earlier made 107, but his wicket triggered a slide to 237 all out. The Irish finish fifth in Pool B, behind West Indies on net run-rate, while Pakistan go on to meet Australia in Adelaide in the last eight on Friday. Before the tournament, Cricket Ireland chief executive Warren Deutrom said it would be a “failure” if Porterfield’s side did not reach the quarter-finals. But for the third World Cup in succession, the Irish have acquitted themselves well, winning three games and beating two Test-playing sides in West Indies and Zimbabwe. England won only two matches, neither against Test nations. Indeed, Ireland could have reasonably expected to go through with six points, only for their elimination to come as a result of several factors. Heavy losses to South Africa and India damaged their net run rate, West Indies earned three big wins to boost theirs, while Pakistan recovered from two opening defeats to claim four successive victories. This latest win continues the improvement of Misbah-ul-Haq’s men, echoing the Pakistan side that began poorly when the tournament was last held in Australia and New Zealand in 1992, only to go and lift the trophy. For Ireland, their creditable showing will be used as evidence by those who say the next World Cup should not be cut from its current 14-team format to only 10 sides. The Irish still have the chance to qualify for that tournament as well as the opportunity to earn Test status through the 2017 Intercontinental Cup. Joe Schmidt has is braced for sleepless nights as he searches for “marginal gains” in the wake of their 23-16 loss to Wales. The Ireland boss has never shied away from his status as a rugby scholar, but being driven to insomnia by missing out on an Six Nations Grand Slam could be a first. Wales coach Warren Gatland revealed victory would mean he would not struggle to drag himself out of bed – before Schmidt explained how defeat will just drive him deeper into his already supremely-detailed analysis. “I’ll struggle to go to bed to be honest,” said Schmidt about how he copes with defeat. “I’ll look at the game, I’ll think about the what-ifs and the maybes, because I think there were a fair few what-ifs and maybes. “I’ll look at the last lineout drive, I’ll look at the scrum, I’ll look at the 22 and the pressure and how close we got to getting over the line, and the small margins and marginal gains that if you manage to do that then you potentially change the result. Scott Williams’ second-half try floored Ireland, who dominated territory and possession but could find no route through Wales’ resolute defence. Ireland did claim a penalty try, but were made to pay for a rudderless first 20 minutes. Schmidt’s side can still retain their title, but must now rely on a points-difference triumph, just like last season. England scaled the Six Nations table with 25-13 victory over Scotland at Twickenham, although the top three teams all have six points going into the final round. Ireland must now hope to better England and Wales’ points-difference tally as well as seeing off Scotland in Edinburgh on Saturday. Wales boss Gatland conceded victory would allow him to avoid the depths of depression that follow Test match defeats. “I’ve been through the other side of things on a number of occasions when we’ve lost key games when we’ve been in front through critical moments,” said Gatland. “As coaches it means a lot to us. “When you suffer a loss the next three or four days are a struggle, even in terms of getting out of bed sometimes. Emotionally it just shows we were definitely with the players in knowing how important it was today to get a result and a victory. Ireland’s hopes of reaching the World Cup quarter-finals suffered a blow as India sealed top spot in Pool B with a fifth straight win in the tournament. Ireland came into the match knowing that a point would see them qualify. Despite an opening stand of 89 between William Porterfield and Paul Stirling and 75 from Niall O’Brien, their 259 total was never likely to be enough. 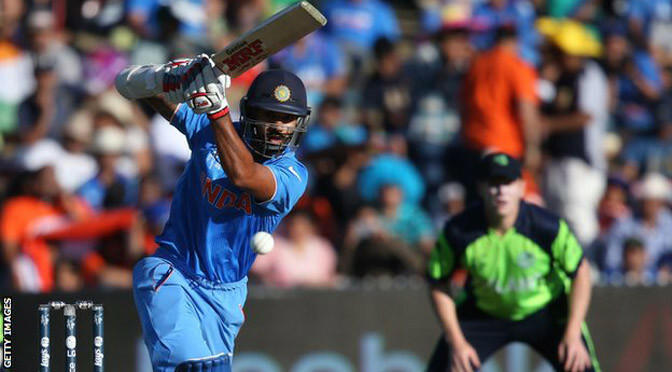 So it proved as Shikhar Dhawan (100) and Rohit Sharma (64) helped India to a comfortable eight-wicket victory. The margin of defeat is a reality check for Ireland, who have performed well above expectation in this tournament, claiming three wins (two against Test-playing nations) to give them six points and genuine hope of reaching the last eight. They can still do so, but they will need to beat Pakistan in their final pool game or gain a point should the fixture be rained off. Much like their game with South Africa, in which they conceded 411 runs before being bowled out for 210, the gulf in class between the sides in Hamilton was vast. 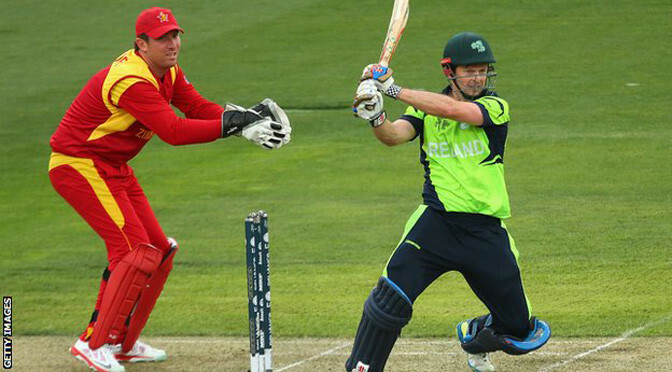 Ireland maintained their quest for the World Cup quarter-finals with a tense five-run win over Zimbabwe in Hobart. Ed Joyce made 112, while Andy Balbirnie was run out three short of a maiden hundred as Ireland posted 331-8, their highest one-day international total. Zimbabwe required the highest chase in World Cup history and Brendan Taylor hit four sixes in 121 from 91 balls. Seven were needed from the final over but the last two wickets fell as the Zimbabweans bowed out of the event. Ireland next face unbeaten India, who have already qualified, on Tuesday. The Irish team’s final match is the last of the group fixtures in the tournament, against Pakistan on 15 March, when West Indies face UAE, and is likely to determine which other three sides will advance to the quarter-finals from Pool B.
Ireland march on towards a possible Grand Slam after inflicting a thumping defeat on a misfiring England. Four penalties from Jonathan Sexton and a second-half try from centre Robbie Henshaw opened up an unbridgeable gap which accurately reflected the one-sided nature of what was expected to be a tight contest. England were outplayed in all departments, starting slowly, consistently second-best at the breakdown and all too fallible under the high ball until a late rally. After all the optimism engendered from their unbeaten start to the Six Nations this will go down as one of the most chastening defeats of Stuart Lancaster’s regime. With trips to Wales and Scotland still to come, Ireland face a testing March if they are to win a second consecutive Six Nations title, let alone a second Grand Slam in six years. But after this record-equalling 10th successive Test victory, Joe Schmidt’s men will travel with optimism, their status as the northern hemisphere’s most effective team underlined in some style. Ireland had begun at pace, turning over a sleepy England at the first breakdown and winning two quick penalties to allow Sexton to kick them into an early six-point lead. George Ford replied with a drop-goal on England’s first foray into the Irish half but his side twice wasted fine territory through lost line-outs and, after Luther Burrell was overrun by green shirts on his own 22, Sexton’s third simple penalty made it 9-3. Ireland were dominating the breakdown, England twice penalised for offside as they struggled to cope with the ferocity of the Irish attacks. Sexton was relishing his battle with the young apprentice Ford, smashing him backwards in the tackle and orchestrating a more expansive handling game for the hosts than in their victories over Italy and France. The sole comfort for England at the break was to be just six points behind, having been starved of possession and conceded a remarkable 10 turnovers in that first period. England were being pinned back by Sexton’s probing kicking from hand, unable to exert the control they had hoped for at the set-piece and poor under the predictable hailstorm of garryowens. And when the impressive Conor Murray’s box kick into the corner was claimed by Henshaw above the backpedalling Alex Goode, a steep slope became a mountain. Sexton’s conversion from out wide made it 19-3 and seemed likely to trigger an avalanche. Two penalties from Ford halted the advance before England’s replacements made the contest – if not the scoreboard – a more even affair in the final 20 minutes. But although Ireland tired as the match wore on, the damage had already been done, and the capacity crowd in Dublin celebrated a win that was never in doubt. 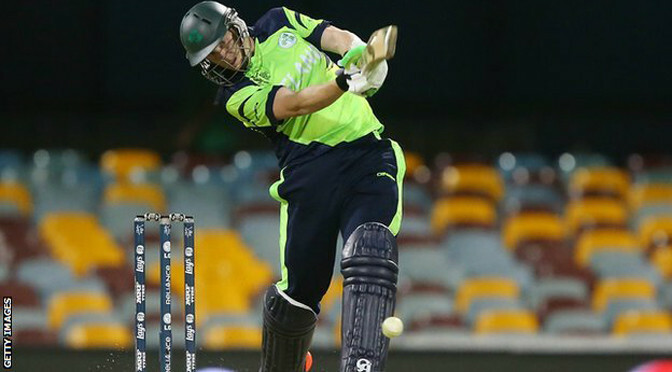 Gary Wilson hit 80 to help Ireland to a nervy two-wicket World Cup win over the United Arab Emirates in Brisbane. Shaiman Anwar scored a maiden ODI century as the UAE part-timers hit 147 from their last 15 overs to post 278-9. They then pegged Ireland back to 97-4, but Kevin O’Brien (50) and Wilson put on 72 from 36 balls for the sixth wicket to help rebuild the innings. Ireland, who have two wins from their opening two Pool B games, next face South Africa in Canberra on 3 March. O’Brien and Wilson were both dismissed as William Porterfield’s side closed in on the target, but Brisbane-born Alex Cusack and off-spinner George Dockrell kept their nerve to lead Ireland to victory with just four balls to spare. World cricket’s governing body the ICC has decided to limit the next World Cup to 10 teams, but two associate sides who may struggle to qualify for the event in England in 2019 arguably played out the most exciting match of the tournament so far, one that was finally settled in the 100th and final over after 557 runs and 17 wickets. The game ebbed and flowed, with Ireland reducing the UAE to 131-6 in the 35th over, before Shaiman (106 from 83 balls) and Amjad Javed (42 from 35 balls) put on a World Cup record seventh-wicket stand of 107 to set up a challenging total on a turning wicket. Ireland struggled for any fluency in their reply, until the more expansively minded O’Brien joined Wilson at the wicket in the 39th over with 108 runs still needed. O’Brien and Wilson’s six-over partnership seemed to turn the match decisively in Ireland’s favour, but when O’Brien, Wilson and John Mooney all fell in the final seven overs, the UAE sensed a first win over Ireland since 2001. Dockrell and Cusack came together with 12 runs still needed from 15 balls, and after a series of wild swings and unconvincing hacks, the pair finally wrapped up victory in the final over. 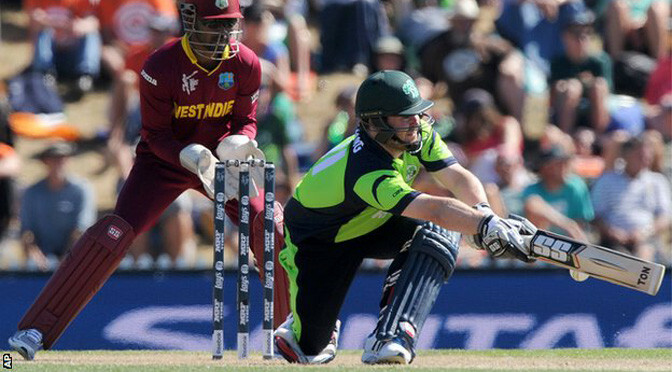 Ireland caused the first shock of the World Cup with a four-wicket triumph against West Indies in their opening Pool B match in New Zealand. Lendl Simmons (102) shared 154 with Darren Sammy (89) as the Windies recovered from 87-5 to post 304-7. But Ireland’s Will Porterfield and Paul Stirling put on 71 and Stirling (92) then shared 106 with Ed Joyce (84). Niall O’Brien added 79 not out as Ireland won with 25 balls left, their fourth World Cup win over a Test team. Having beaten Pakistan in their first World Cup in 2007 and England in the 2011 tournament, Ireland were almost considered favourites from the outset at the picturesque venue in Nelson on the south island. The Windies, winners of the first two World Cups in the 1970s, now languish eighth in the ODI rankings, were skittled for 122 by England in a warm-up match and are rumoured to be in disharmony following the omission of Kieron Pollard and Dwayne Bravo from their squad. Ireland, ranked 11th, reached the second group stage in 2007 and now have matches against the UAE, South Africa, Zimbabwe, India and Pakistan to try and secure a top-four spot in Pool B and a place in the quarter-finals. Their intrepid fielding and accurate seam bowling after choosing to field quickly led to two wickets falling in the eighth over. Big hitting Gayle and Marlon Samuels both launched towering straight sixes before both were dismissed by 22-year-old George Dockrell in the 22nd over, the left-arm spinner securing figures of 3-23 at one point. Sammy unleashed some innovative strokes, often with ferocious power, in a thrilling partnership with Simmons, who accelerated stylishly as West Indies became the fifth successive team in the tournament to post in excess of 300 when batting first. But far from overawed, the Irish openers punished some loose bowling in a fluent 13-over stand. Man-of-the match Stirling hit three sixes in his pugnacious innings and was within eight of his sixth ODI hundred when, suffering from severe cramp, he edged behind in the 28th over with 128 still needed. With the Windies looking ragged and forlorn, Joyce effortlessly guided the Irish within 32 of the target and despite three wickets in 17 balls, John Mooney, just as he did against England four years ago, struck the winning runs. Ireland, coached by former West Indies batsman Phil Simmons, uncle of Lendl, next face fellow qualifiers UAE on 25 February. 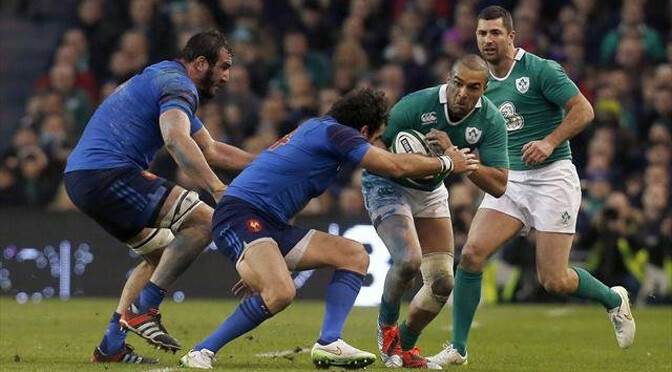 Ireland remain unbeaten in this year’s Six Nations after a gritty victory over a disappointing France in Dublin. Man-of-the-match Jonathan Sexton, who had been out for three months with concussion, kicked four first-half penalties as Ireland led 12-6 at the break. With both sides engaged in a torrid battle at the breakdown there was little flair on display and fans had to wait until well into the second half for the first clear-cut try-scoring opportunity, which Ireland butchered. French lock Romain Taofifenua scored the only try of the match after 70 minutes but two more penalties had already made Ireland safe. Joe Schmidt’s Ireland, the defending champions, have now won nine games in a row and host England, who are also unbeaten in this year’s tournament, in two weeks’ time. And Schmidt will be buoyed that Sexton, flanker Sean O’Brien and prop Cian Healy, who were all returning after long injury lay-offs, came through a tough battle unscathed. It was expected that giant French centre Mathieu Bastareaud would target Ireland fly-half Sexton, but it was Sexton who went looking for Bastareaud early on, bringing the Toulon man to a juddering halt and earning his side the put-in at the resulting scrum. Tommy Bowe nearly latched on to diagonal kick from Sexton, but a penalty had already been awarded and the Racing Metro number 10 duly kicked the hosts into the lead. France levelled the score through the boot of Clermont’s Camille Lopez, but two more Sexton penalties, after France twice infringed at the breakdown, gave Ireland a six-point lead. Teddy Thomas, who had looked one of the liveliest of the French three-quarters, limped off shortly before half-time, before Lopez reduced Ireland’s lead to three points after Rory Best was penalised for being caught on the wrong side at a ruck. But France’s indiscipline cost them again, allowing Sexton to pop over a simple penalty and make the score 12-6 to Ireland at the break. It had been an attritional first half, more notable for the number of infringements and turnovers at the breakdown than any commitment to creativity or attacking verve. Shortly after the restart, Ireland full-back Rob Kearney fielded a high kick in the French 22 and Sexton was clobbered by Bastareaud from the resulting attack. Having clashed heads, both players were led from the field, with Sexton replaced by Leinster’s Ian Madigan. Madigan increased his side’s lead with his first attempt at goal and with France’s scrum also starting to creak, Ireland appeared heavy favourites with 30 minutes to go. Both sides lost a man to the sin bin, while Sexton, who returned to the fray after 55 minutes, should have set up his side’s first try, but centre Jared Payne was unable to gather the fly-half’s fiery short pass. Sexton slotted his fifth penalty before replacement lock Taofifenua touched down unopposed after the visitors, despite making handling error after handling error, eventually found a way through Ireland’s defence. With replacement prop Vincent Debaty making his presence felt up front, France gradually improved as the second half wore on and at least attempted to put width on the ball in the final stages, but despite a late assault they were unable to deny Ireland victory. 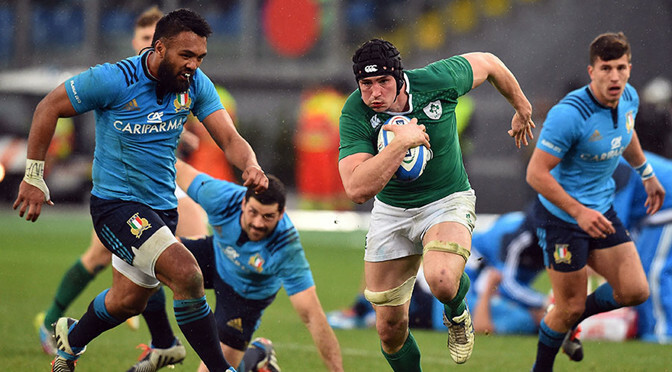 Defending Six Nations champions Ireland made a winning start to the 2015 campaign, but will need to improve drastically on their performance against Italy if they are to repeat last year’s success. Ian Keatley landed three penalties from three attempts in a first half that saw both teams struggle to string any flowing play together. Only a Kelly Haimona penalty as time expired prevented Italy from being shutout in the first half on home turf. However, the sin-binning of Leonardo Ghiraldini proved the catalyst for Ireland to finally make their overall superiority pay. First Conor Murray scurried over from a ruck for the first try of the match and then Tommy O’Donnell – a late replacement for Sean O’Brien who pulled a hamstring in the warm-up – burst free from 45 metres to pull Ireland clear once and for all. Italy were denied a consolation try after the TMO ruled that Sergio Parisse had knocked on in the build-up to Kelly Haimona’s touchdown. 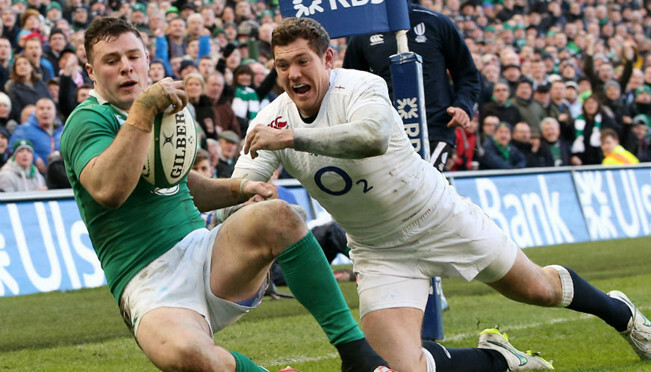 Keatley made his overdue Six Nations debut as Ireland took on Italy in Rome. The 27-year-old fly-half deputised for British and Irish Lions playmaker Johnny Sexton, who will return to face France in Dublin next weekend after a 12-week concussion lay-off. Italy had back-row agitators Sergio Parisse and Alessandro Zanni back in tandem, with New Zealand-born fly-half Kelly Haimona leading the line. Flanker O’Brien pulled out of Ireland’s line-up in the warm-up just minutes before kick-off, nursing his hamstring. The luckless Leinster man’s injury problems rumble on: the 27-year-old has still not featured in Test action since November 2013. O’Brien had ice strapped to his left hamstring as he took to the bench to watch the match. Italy proved the architects of their own discomfort right from the off, Matias Aguero penalised for slipping his bind at the scrum. George Biagi’s cheap knock-on gifted Ireland field position, and a pointless midfield offside allowed Keatley to open the scoring from the tee. Jack McGrath atoned for conceding a scrum penalty by winning a fine choke-tackle turnover, in tandem with Peter O’Mahony. Munster fly-half Keatley endured a mixed opening quarter, slotting his penalty calmly, but throwing a loose pass and also being charged down by Michele Campagnaro. Ireland threatened through careful build-up, only for Simon Zebo to knock on Conor Murray’s ambitious inside pass. All the fizzing electricity from England’s tournament opening 21-16 win over Wales in Cardiff turned to dismal static in a humdrum first half in Rome. Keatley doubled his and Ireland’s tally after Luke McLean wandered offside to retrieve Andrea Masi’s knock-on. For all their possession however, Ireland lacked any spark. Joe Schmidt’s men fought hard for fluency, but settled instead for stoic territorial control. Keatley had to scamper to retrieve a loose miss-pass from Murray, while Robbie Henshaw knocked on out wide. Ireland drove close from a lineout maul, but Tommy Bowe could not tap Murray’s deft chip back inside with enough space for the scrum-half to wriggle home. The visitors had to settle instead for Keatley’s third penalty of the afternoon. Italy then set up camp in Ireland’s 22 but after one driving maul Kelly Haimona opted to strike at goal. The New Zealand-born fly-half landed the goal to cut Italy’s deficit to six points at the break. Ireland started the second half searching for some kind of fuel injection, but still their attack misfired. Keatley produced a neat half-break on the blindside, only to force an attempted final pass. Campagnaro knocked on trying to intercept, allowing Ireland a quick wipe of the brow. Keatley almost cut the line again in Italy’s 22, but Parisse produced a fine ruck steal to ease the pressure. Jared Payne raced close after Simon Zebo’s neat wide pass, but Robbie Henshaw knocked on trying to sneak through. Payne and Henshaw noticeably picked up the pace after the break, but again Ireland turned to Keatley’s boot to extend their lead to 12-3. Ireland dispensed with posting penalties, instead going for the jugular just past the hour, punting to the corner for an attacking line-out. Leonardo Ghiraldini spoiled Ireland’s maul from an offside position and was duly sin-binned for his troubles. Ireland went straight for the lineout once more and finally broke the try deadlock. Murray wriggled home after the pack drove to the whitewash, with Keatley converting for a 19-3 lead. No sooner had Ireland scored than boss Joe Schmidt brought off Keatley, Paul O’Connell and Peter O’Mahoney, no doubt with one eye on next weekend’s France clash. Tommy O’Donnell then raced through Italy’s porous midfield to rubber-stamp Ireland’s victory. Ian Madigan slotted the conversion to add gloss to the scoreline, but Ireland were unable to maintain that momentum once Italy were restored to full complement. Italy’s rally forced Ireland to defend with zeal and composure at the death when Schmidt’s men would sooner have been attempting to boost their points-difference tally. Andrea Manici’s sloppy spilled ball dented Italy’s momentum before Haimona had a try ruled out for the slightest of knock-ons from Parisse.